The Moolavar is Pavalavannan seen in standing posture facing west. There is a sannadhi opposite this sannadhi about 2 furlong away. The Moolavar here is Pachaivannan seen seated on Aadiseshan. The two sannadhis together are considered as one divyadesam. It is said that both the Pacchai and Pavala Vannan perumal has to be worshipped, without leaving any one of them. Opposite to Pavala Vannar Sannadhi, 2 1/4 kms away is the Pacchai Vannar Sannadhi is situated in west direction. Inspite of the Mangalasasanam not done in Pacchai Vannar sannadhi, both these two temples are considerded to be the single and has to be worshipped as a single Divya desam. Pacchai vannar, who is also called as "Maragatha vannar" explains in this sthalam that he is the hamsam of Lord Shiva and Pavala Vannar as the hamsam of Para sakthi. So it is said that by worshipping these two sthalams at the same time, we worship both Lord Shivan and Parashakti. About half-a-mile north-east of Lordess Kamakshi Temple, Periya Conjeevaram. You may proceed still westward to worship Lord Pachaivannar Sannidhi also. 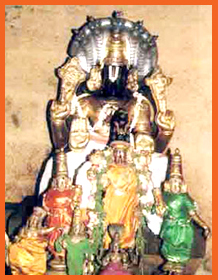 The Moolavar of this sthalam is Sri Pavala Vannar. Also called as "Paramapatha Nathan" - Moolavar in Irundha Thirukkolam on Aadhiseshan facing his thirumugham towards West Direction. Prakthayaksham : For Brighu Maharishi, Aswini Devathai and for Parvathi. This sthalam is found near Railway station and is close towards Sri Kamakshi Amman temple in Big Kanchipuram.